Electrical sockets in bathrooms – why not? This topic has 49 replies, 37 voices, and was last updated 5 years ago by gwaelod. Why are electrical sockets not permitted in UK bathrooms? Surely, an IP rated socket with a RCD would be safe enough? So you can’t plug normal electrical stuff in and mix it with water. Someone would try drying their hair in the bath, you do realise that don’t you? Partly because of the above and – partly because in the “olden days” we still used fuse wire while the rest of europe had long gone over to trips/rcd/etc. Someone would try drying their hair in the bath, you do realise that don’t you? Would the RCD not save them? We are allowed to have them here in Germany… not everything is verboten… common sense seems to work fine. Like not having fences alongside the railway… people seem to get the fact that trains and people dont mix.. simples. In theory, of course but while I like Darwinism, I’m not sure I’d really fancy putting it to the test. The problem is that things can deteriorate over time and the logic is presumably that you avoid the risk by not putting it there in the first place. Surely that applies to absolutely everything? Shaver sockets are 240v or 120v but are isolated via a transformer. So you would have to grab hold of both wires for a shock not just one via ground. .. or the authorities in Germany don’t give a crap. Anyway – sockets in bathrooms means appliances in bathrooms. And appliances don’t generally like being splashed with water and then handled by wet hands etc etc. That’s why we have light pull cords instead of switches too. Shavers are a litle different – they are a small class of devies and they probably have regulations to make them at least somewhat water-resistant. But a bathroom with no 240v sockets in it, won’t deteriorate over time into a bathroom full of 240v sockets will it ? Because we’re all such a miserable gloomy lot what with successively bad governments, awful weather and high taxes, they’re worried that the suicide rate would go up. Death by hairdryer and all that. When I was growing up, my parents’ bathroom had an ancient Victorian socket in it – a round ceramic thing with exposed terminals, at ankle height on the skirting board. My bathroom’s got a full strength socket at head height, above the basin – perhaps the Spanish aren’t generally as stupid as the British? Really can’t see what the risk is TBH, if you’re stupid enough to try and use a hairdryer in the bath you’re probably stupid enough to run an extension lead in from out of the room, too. As above. Electric fire or fan heater in the bathroom, accidentally splash, touch, shock. It’s also pretty humid in bathrooms generally, so water can get into all sorts of places and allow current to travel. My old caravan had damp – if I plugged it in after a wet journey I’d get a shock off the A frame. I’m sure I’ve heard that British electrics are one of if not THE safest in the world. Maybe this is part of the reason. Also, why the hell does anyone need a socket in the bathroom anyway? I can’t think of anything is want to plug in in there. I’m never in more than 15mins! Its a throw back from the fuse days where it could take seconds for a fuse to cut the circuit or there was a risk of people fitting the wrong fuse. But now we’re stuck with the rule who in there right mind is going to change electrical rules to something that is less safe? We also have fuses in our plugs. We like our belts and our braces in this country. Its one of those things that makes us quirky compared to the rest of the world – which I like! Shaver sockets include an isolation transformer, so you can’t easily get a shock off them as there is no potential difference between earth and live, although there is between Live and Neutral. The current limit comes from the size of the transformer. 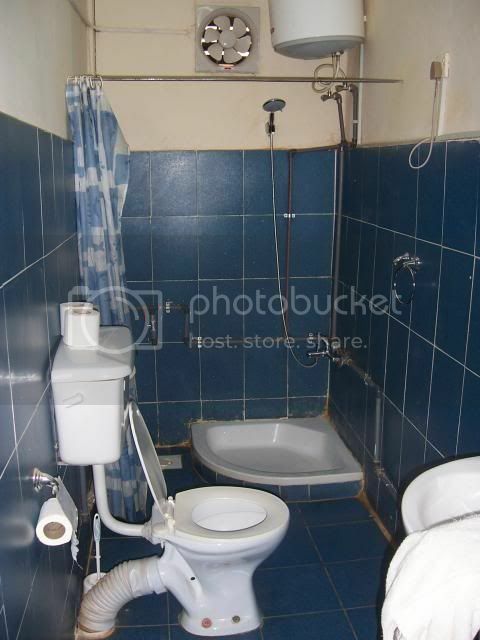 This was the bathroom of an hotel where I stayed in Khartoum…. notice the handy electrical socket up there on the right. Would you want to die in a place like that? Also, why the hell does anyone need a socket in the bathroom anyway? why is the toilet connected to an extractor fan? I use my Wahl clippers in the bathroom. A hairdryer would be the other obvious item. I suppose humidity could be a reason not to have one, although that would seem to argue against having electric lights in there, too? Yeah but you don’t touch the lights – hence the pull cord lightswitch with the switch on the ceiling. And condensation tends to run down, so the lights are probably quite safe up there. Some interesting points there but I still can’t see how it is dangerous with a correctly operating RCD. so the lights are probably quite safe up there. They have to be certified for use in a bathroom different zones within the bathroom. unless your mounting them in an odd place on the wall in the bath/floor level or have very low celings then normal lights will be dandy in your roof. Winston, it’s not dangerous relying on rcd’s (not within reasonableness at least) and it’s an outdated requirement, but who’s going to amend building regs to relax them? No-one will, they are only amended to make them more stringent. Similarly with fuses in plugs. Socket are allowed but need to be at least 3m (IIRC) from the bath..
Because the big green wiring regs book I keep in the office says no. it’s an outdated requirement, but who’s going to amend building regs to relax them? The rules have been relaxed a lot regarding what you can and can’t do in a bathroom – including allowing a socket 3m away from zone 1. That relaxation was a result of a new requirement for everything in a bathroom being RCD protected. An RCD will protect you from shock, but you also need to think about whether an appliance which is going to plugged into the socket is suitable for the environment. Is it really sensible to give somebody the option to use a hairdryer in the bath, or to have a radio plugged in next to the shower?? Hmm, there seems to be a myth developing that RCD’s protect you from a shock – they don’t, they just limit the time you get a shock for. They do limit the chance of electrocution to less than a 1% chance. Even so, anyone with a weak heart, or frail (the very old/young) should never rely on a RCD to protect them. They should trip in less than 300mS (or 40mS for higher currents). That doesn’t sound long – less than a third of a second, but it will make you tingle for quite a while afterwards if you do get a belt off a live conductor. Also, I find around 5% of RCD’s are not reliable. How often do you press the test button on your RCDs at home? Should be done every 3 months, but I’d say 90% of people never do it. It is worthwhile doing it, as the contacts sometimes stick, and tripping them clears this, thus giving continued safe use. Mostly a culture thing IMO, I worked in the German speaking part of Switzerland (Uzwil) & the lack of machine guarding would have given your average UK HSE inspector a fit. Their reasoning was paint a line round it marked “do not cross” and people wouldn’t but in the UK we would be saying “why not” and merrily push limbs into rotating stuff? My brother told me the following yonks ago. A chap was found dead in his bath. The cause was investigated. He liked a long soak but didn’t like the water going cold. He hit on the following plan: took the element and lead from an old kettle, plugged it into a wander lead. He supported it on a string over a pulley on the wall. When the bath started to cool he’d lower the lead and switch on the element to warm up the bath. One day the string broke. I can hoover the whole house from pretty much any socket upstairs or down. I’ve got a massive fridge in the kitchen. If I need another beer THAT BADLY whilst in the bathroom, it’s Alcoholics Anonymous I need, not a fridge! If I wanna go pee whilst watching TV, I pause it. Its a throw back from the fuse days where it could take seconds for a fuse to cut the circuit or there was a risk of people fitting the wrong fuse. Pretty much any fuse is rated at far more amperage than it would take to kill you. RCDs are for protecting people, a fuse only really protects the hardware. We also have fuses in our plugs. We like our belts and our braces in this country. Given that most appliances only draw a couple of amps in makes sense to have an appropriate fuse in the plug rather than relay on the 20amp fuse in the mains box to protect anything – those fuses (where houses still have them) are protecting the wiring in the house, not the things that are plugged into it. But in bathroom terms then while RCDs are safer than old fashioned fuses they’re not entirely fail-safe and they are quite delicate mechanisms – given how rarely the ones in your consumer unit are tripped and reset how do you know they haven’t seized up or corroded? Do you have them tested and expected regularly? You’d hope pressing the ‘test’ button is analogous to a real world fault, it might not be. Your house doesn’t have to pass an annual MOT like your car does. Its a simpler and safer regulatory arrangement to just not install LX in bathrooms than to sanction it with a load of conditions – design out the accident rather than try to make accidents safer. What- with a clothes peg or something? When did you last have your RCD’s tested? Here in the US, bathrooms have regular wall sockets, but code requires RCD sockets (same in the kitchen). I recently had my electrician check my RCD sockets (20 years old) and all functioned perfectly–still wouldn’t want to drop the hair-dryer in the tub while Mrs busydog was taking a bath. The topic ‘Electrical sockets in bathrooms – why not?’ is closed to new replies.